Trump’s AG pick was top cop during the federal siege and killing of Randy Weaver’s wife and son. That charitable work (for an FBI agent who already had a federally-paid law firm defending him) helped tamp down one of the biggest scandals during Barr’s time as Attorney General from 1991 to early 1993. Barr was responsible for both the U.S. Marshals Service and the Federal Bureau of Investigation, two federal agencies whose misconduct at Ruby Ridge “helped to weaken the bond of trust that must exist between ordinary Americans and our law enforcement agencies,” according to a 1995 Senate Judiciary Committee report. After Randy Weaver, an outspoken white separatist living on a mountaintop in northern Idaho, was entrapped by an undercover federal agent, U.S. marshals trespassed on Weaver’s land and killed his 14-year-old son, Sammy. The following day, FBI sniper Lon Horiuchi killed his wife, Vicki, as she was standing in the cabin doorway. Horiuchi had previously shot Randy Weaver in the back after he stepped out of the cabin. The suspects were never given a warning or a chance to surrender and had taken no action against FBI agents. Weaver survived. After an Idaho jury found Weaver not guilty on almost all charges, federal judge Edward Lodge slammed the Justice Department and FBI for concealing evidence and showing “a callous disregard for the rights of the defendants and the interests of justice.” A Justice Department internal investigation compiled a 542-page report detailing federal misconduct and coverups in the case and suggested criminal charges against FBI officials involved in Ruby Ridge. Barr told the New York Times in 1993 that he was not directly involved in the Ruby Ridge operation. 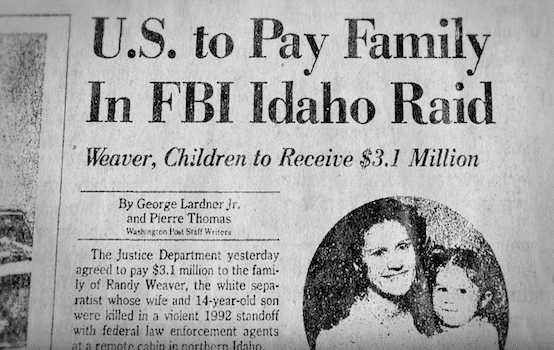 Two years later, the Washington Post revealed that “top officials of the Bush Justice Department had at least 20 [phone]contacts concerning Ruby Ridge in the 24 hours before Vicki Weaver was shot,” including two calls involving Barr. The Justice Department paid $3 million to settle a wrongful death lawsuit from the Weaver family. But when Boundary County, Idaho filed criminal charges against Horiuchi, Barr sprang to action seeking immunity for FBI snipers. He spearheaded efforts to sway the court to dismiss all charges because holding a sniper liable would “severely undermine, if not cripple, the ability of future attorneys general to rely on such specialized units in moments of crisis such as hostage taking and terrorist acts. Does William Barr still endorse “wartime rules” and a “007 standard” that absolve federal agents for questionable shootings of Americans? Does Barr consider “illegal government killings” to be an oxymoron? Best of all, can Barr explain to us his understanding of the phrase “government under the law”?